Correct selection of the frequency converter or frequency changer is crucial for the normal operation of electronic control system for mechanical equipment. To buy the frequency converter, according to the type of mechanical equipment, load torque characteristics, speed regulation range, static speed accuracy, starting torque and the requirements of the use environment, and then choose the suitable frequency converter. Before selecting the frequency converter (AC power supply), we should firstly make clear the input mode of load, it is three phase or single phase? Secondly, determine the load characteristics, such as resistive load, inductive load, capacitive load, mixed load. 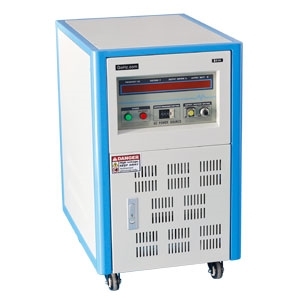 Since different load characteristics will cause different inrush currents when the load starts, the influence of inrush current must be considered when buying the frequency converter, otherwise converter will not output normally. Resistive load: Frequency converter selection power = (1.1-1.5) × load power. Power factor is 1 or close to 1, basically has no starting inrush current. For example: electric furnace heating wire, filament lamp, thermal resistor and other heating equipment. Inductive load (mainly motors): According to different starting modes of motor, the capacity of frequency converter is selected by the actual starting current of motor. If the motor’s starting current can not be determined, it can be estimated according to its starting mode. Motor direct starting: the starting inrush current equals to the motor blocking current, which is generally 5-7 times of the motor’s rated current, and the starting time is several to decades seconds. Motor star-delta starting: the starting inrush current is generally 3-4 times of the motor’s rated current. Motor starts with VFD: the starting current is limited to 1.5-2 times of the motor’s rated current. Motor starts with soft starter: generally, the way of reducing voltage and limiting current by changing conduction angle with thyristor is used. According to the load type and soft start parameters, the starting current is 3-4 times of the motor’s rated current, and the starting time is 5s-1 min. Note: Apart from above, there are still some special starting modes, such as resistance testing of motor, positive inversion, should be selected by actual conditions on site. Analysis: Since the customer tests each air compressor separately when testing the air compressor, it is sufficient to select the converter size according to the maximum inrush current of the four air compressors. 18kw × 7=126kW, 45kW × 4=180kW. So the final customer chooses 200kVA frequency converter. Capacitive load: Compared with the power supply, the load current is one phase difference ahead of the load voltage, and the load is thereof defined as capacitive load (such as compensating capacitor load). Impact current of this load is very large, and it is equivalent to short circuit when charging. It’s typically loaded with caching devices or mixed with other loads. The starting impulse current of this load is 5-10 times or higher than its rated current. Mixed load: The load containing two or more kinds of above loads is called mixed load. For this load, the starting inrush current shall be added respectively to get the capacity of frequency converter. Case: A customer produces water dispenser, the water dispenser has dual functions of heating and cooling, and the water dispenser is rated power at 1kw. Analysis: The heating function is realized by heat generating device, and the cooling function is generally realized by compressor. The heat generating device is generally a resistive load, and the compressor is an inductive load. After further understanding, the power of the built-in compressor of the water dispenser is 0.75kw. 0.25kw × 1.1+0.75kw × 6=4.775kw, so the capacity of frequency converter will be 5kVA. Knowing these, we can select the proper frequency converter easily. ATO.com provides single phase and three phase solid state (static) frequency converters, convert the existing power source to simulate different countries' power source, 60 Hz to 50 Hz, 50Hz to 60Hz and 400 Hz that supply high quality output electricity for your loads. To get more details about ATO frequency converter, please move to the product pages or contact us now!